Just like diabetes, thyroid disease is caused by a hormonal imbalance, although the hormones involved are different. Thyroid disorders are mostly related to either an overproduction of thyroid hormones (hyperthyroidism) or an underproduction (hypothyroidism). It is highly advisable to get a thyroid health checkup as well as a diabetes health checkup regularly. Talk to your doctor to get an appropriate advice. The thyroid problem is more common in women than in men and around 7 percent of the population has some type of thyroid disease. People with type 2 diabetes would have a 12 percent chance of developing thyroid disorder and people with type 1 have an approximate 1-in-3 chance, which is quite high. Because of the high risk of thyroid disease among people with type 1 diabetes, it’s essential for them to get a thyroid health checkup along with a diabetes health checkup. It’s wise to be aware of its symptoms in order to detect hormone abnormalities early before blood glucose levels get poorer. A simple blood test in a thyroid health checkup can detect thyroid disorder. Hypothyroidism is marked by fatigue, lethargy, depression, constipation, weight gain, low blood pressure, a slow pulse, and intolerance to cold. Hyperthyroidism may cause sweating, weight loss, diarrhea, distraction, menstrual changes in women, rapid heart rate, and thick skin on the knees, elbows, and shins. Both untreated hypothyroidism and hyperthyroidism may cause goiter, a condition where the thyroid gland to become abnormally large. An increased metabolism from hyperthyroidism can cause diabetes and other medicines to be deleted from the body too fast, reducing their effectiveness. Diabetes and thyroid disease can be controlled by adjusting treatments for both. A properly tuned thyroid and diabetes checkup can keep the body’s metabolism steady and can keep you healthy. Research suggests that women older than age 60 are more likely to have hypothyroidism. This condition disturbs the normal balance of chemical reactions in the body. It hardly causes symptoms in the early stages, but if left untreated it can cause many health problems like obesity, joint pain, infertility, and heart disease. An accurate thyroid health checkup will be able to diagnose hypothyroidism. The treatment is usually safe and effective and your doctor can find the right treatment for you. Thinning hair, slowed heart rate, depression, and impaired memory. No treatment, what happens next? When hypothyroidism isn’t treated, signs and symptoms can gradually become more severe. You may become more forgetful, your thought processes may slow, or you may feel depressed. Please get a thyroid health checkup in case you experience a combination of these symptoms. A rare kind of hypothyroidism known as myxedema can even be life-threatening. Symptoms include low blood pressure, difficulty breathing, low body temperature, unresponsiveness, and even coma. Getting a thyroid health checkup and diabetes health checkup from a reputable healthcare lab such as Hindustan Wellness in Delhi is a wonderful solution to ensure what you are exactly going through and how you can get the way out of it. Summary: Thyroid disorder can be a big problem for young and older adults alike. It is highly suggested to get a checkup to know whether the symptoms you are experiencing are related to thyroid disorder or diabetes. 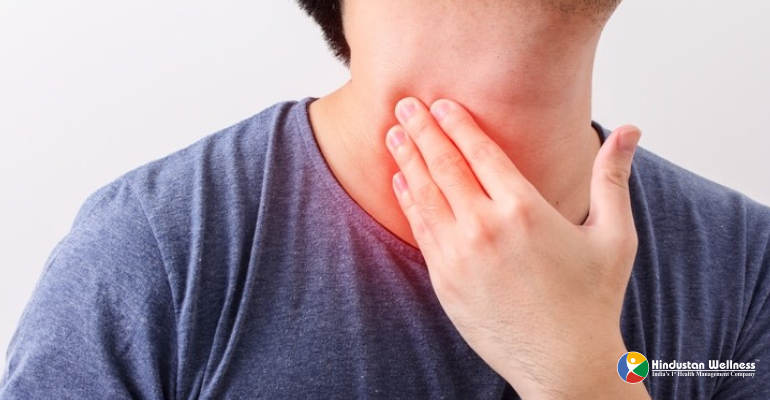 Read about some common signs and symptoms of thyroid disorder to get a better understanding of your body’s situation and know if you need to visit the doctor. PrevWhy Do You Need A Full Body Health Checkup? NextVitamin D Benefits – Why it is so Significant for the Body?